I was producing a line of signature bikes for Scot Breithaupt that were finished shortly before the untimely death of Scot in July. to be built and placed in Long Beach at Promenada Square. Most people know Scot “The OM” Breithaupt was one of the great pioneers in BMX. In addition to establishing the foundation for BMX racing, Scot set the bar with his innovative bike designs in the 1970’s. In fact, Scot’s PK Ripper is one of the most famous BMX bikes ever built and is still around to this day. Scot went on to do many other business ventures over the years, but he always held a burning desire to start another bike project. One of his final projects was the development of two OM Signature beach cruiser bike designs in a joint venture with Jim “Scooter” Decker of Soul Beach Cruiserswww.soulbeachcruisers.com. This joint venture started in 2014 when Scot saw one of Jim’s Soul Cruiser bikes and opened the dialog about working with Jim on a bike. Scot, being a stickler for quality and details took one of Jim’s bikes for a spin and decided the styling and premium components was something he would be proud to put his name on. Jim has a very successful bike company in his own right, but still got goose bumps every time he spoke with Scot about the business. After all, it was a full circle moment to have the legend that sponsored him as a young boy in BMX, now mentoring him as an adult on bike design and marketing. There were many emails, late night calls, and dreams to take things to a whole new level. Scot wanted to make sure his signature bike had the right logo and name. He went over a long list of options for the Halo design and when the name “Phoenix” was suggested, he knew it was perfect to signify his return…his rising from the ashes! Scot made the final decision to call the single speed Halo model the “Phoenix Fighter”. He decided on the SS Stomper (Scot Signature Stomper) for the larger model with a single and 3 speed option. All the bikes were to be painted with a special metallic Root beer brown that Scot was especially excited about. Unfortunately, Scot passed away tragically while the bikes were in production and he never saw the finished product. The bike frames were completed and painted when Scot passed. Jim was so devastated he considered having all the frames scraped. He talked to friends close with Scot and Scot’s family and the consensus was that Scot would have wanted the bikes to be finished. A decision was also made to have some of the proceeds in the sale of the bikes going toward a fund for a Scot Breithaupt memorial. The bikes are now ready to ship and a very limited quantity is available. Each bike is special OM serial numbered and is considered to be highly collectable. If you want a piece of history, act now as these bikes will not last long. RIP OM. Your legacy will live on with our mutual love for rippin’ and roarin’ on two wheels, whether it is on the BMX track, streets or beach strand. C-Ya on the other side! I wanted to put some things together about our eBikes, systems and batteries. This will be just about batteries. Currently, almost every battery unit we sell uses LG Chem 18650 cells. We did for a time have Samsung 35e cells, but have not used those in some time. We are trying to get a better battery case, where the mount works well on our bikes, but also provides a USB port for running devices. Our first group of batteries we had with these specs worked well, but as the installer I wasnt happy with the mount. I had to modify it far too much for a simple easy installation. Two trains of thought, one is to plug it in, and let it charge until the light on the charger unit goes to green. About 5 hours on full discharge. The theory is that the charger only puts out 54.6 volts, so it cant overcharge. The other train of thought is to purchase a light timer, like what is used for Christmas lights. I have used one of the $9 versions from Home Depot where you pull pins for when the lights come on. Hook up the charger to it, and program it to charge for 2 hours, rest 1 hour, charge 2. This up down cycle puts less charging strain on the battery, and could potentially lengthen the total life of the battery. The batteries are rated for 600 or more charge cycles. That is defined to be full discharge to full charged state. The batteries have a similar life cycle as a cell phone battery has. If you look up LG cell phone battery deterioration you can get an idea how most lithium ion based batteries perform. Heat is a major factor in both the motor and the battery. We recommend during hot times of the year to charge the battery in a cool place. Since we are based in the Arizona desert, we see 120 degree and above garage temperatures, and know that is beyond the safe limits of the battery and charger. We get asked all the time, do we repair bikes? We certainly do here at our location in Tempe, AZ. We can fix nearly any bike. The beauty of a beach cruiser bike is the simplicity. Generally, keep ample tire pressure going and you are ready to ride. With Soul Beach Cruisers, we build a premium bike, but it is easy to maintain. 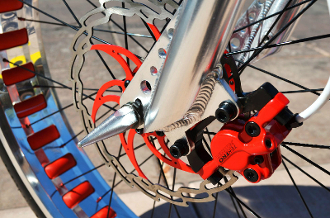 We choose hydraulic brakes because they have little to no maintenance. Brake pads wear out in perhaps 4-5 years of standard dry weather riding. If they get wet frequently, they will wear faster. The Sturmey Archer SX-RK3 3 speed hub is low maintenance as well. It runs sealed bearings on the rotor side, and everything on the shifter side has seals to prevent contaminants from getting in there. Basically, adjust the shifter every once in a while and you are good to go. That is the only real adjustment you do mechanically to the bike. Everything else needs little attention. Our chains are coated in several ways. Most of the chains are plated, with a specialty coating over the top to prevent rust. We run chrome chainrings and cogs, so only the tips of the teeth get wear and could show rust. Keep good air pressure in all of your tires. When ample air pressure is maintained, you get less flat tires. On our fat tire bikes we try to keep 30 psi in them. Thinner tires go a bit higher, sometimes to 40. We recommend a wax based chain lubricant such as White Lightning. This lasts longer, stays cleaner and is easy to apply.